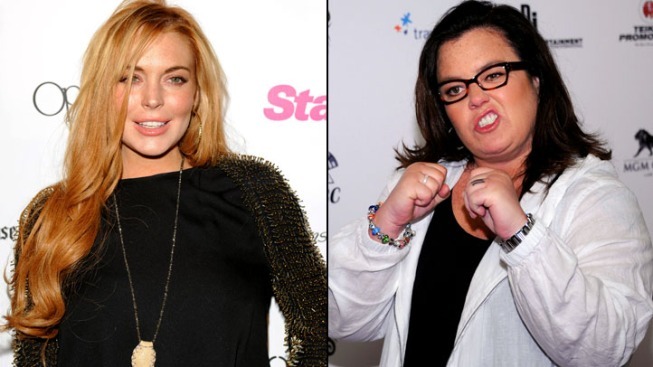 Rosie O'Donnell Clarifies Lohan Criticism on "Today"
Rosie O'Donnell now says Lohan is "quite talented"
Rosie O'Donnell did not apologize for criticizing Lindsay Lohan on the "Today" show. Rosie O’Donnell isn’t backing down after having said Lindsay Lohan was not “capable” to portray Elizabeth Taylor. In response, Lohan told Access Hollywood that, “I know that I’m great” and said that she had been “honored” to take on the role. O’Donnell returned to “Today” Thursday to clarify that her comments were not in reference to Lohan’s acting abilities. But she didn’t apologize. Instead, O’Donnell said she had been concerned by Lohan’s behavior – and compared the actress to Whitney Houston. O’Donnell said she “can’t help but feel” for Lohan, who she said was not a bad actress. “I do not think she’s untalented, I think she’s quite talented,” O’Donnell said.